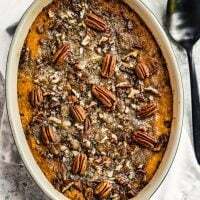 This Sweet Potato Casserole with Pecan Topping is a Thanksgiving classic. Prep this make ahead sweet potato casserole the night before and bake it before your holiday meal! 3 15 ounce cans of sweet potatoes. drained. Pour the butter over the sweet potatoes in a large bowl and mash. Combine ingredients for topping and crumble with your hands until combined. Sprinkle the topping mixture over the potatoes. This can be made ahead! enjoy!